People with more education have higher earnings. Boosting college education is therefore seen by many—including me—as a way to lift people out of poverty, combat growing income inequality, and increase upward social mobility. But how much upward lift does a bachelor’s degree really give to earnings? The answer turns out to vary by family background. If you are among the fortunate few who grow up poor and manage to earn a bachelor’s degree, you might reasonably expect your earnings potential to rise by the same proportion as that of other people who earn a bachelor’s degree. Your actual level of earnings may not match others, but the percentage increase, relative to a high school diploma, ought to be comparable. This is certainly the case in terms of gender and race. Many economists assume this pattern holds for those from different backgrounds in terms of income, too. 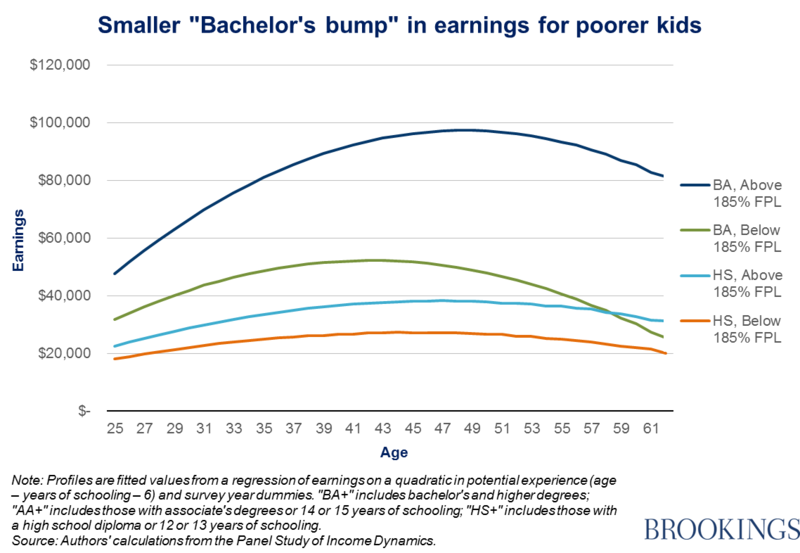 As the chart shows, this earnings gap between poor and non-poor college graduates also widens as time passes. Bachelor’s degree holders from low-income backgrounds start their careers earning about two-thirds as much as those from higher-income backgrounds, but this ratio declines to one-half by mid-career. For individuals without a post-secondary credential, the pattern is less marked. Those from low-income backgrounds initially earn 80 percent as much as those from a higher-income background, dropping to 70 percent by mid-career. What’s behind this rather startling gap? There are a host of possibilities, from family resources during childhood and the place where one grew up, to the colleges that low-income students attend. My colleagues and I are currently investigating and weighing these and other factors. We are also looking to see if our overall findings hold up in other data sets and time periods. My colleagues and I examined career earnings profiles for people with different levels of education (completed by age 25), using the Panel Study of Income Dynamics, a survey that has tracked the same people and their descendants for nearly 50 years. We observe individuals’ lifetime earnings and their parents’ earnings when the same were in high school. To compare earnings across career years and obtain a “present value,” we apply a 3 percent annual discount rate, so that all earnings are relative to age 18. Profiles shown in the graph are fitted values from a regression of earnings on a quadratic in potential experience (age – years of schooling – 6) and survey year dummies. “BA+” includes bachelor’s and higher degrees; “HS+” includes those with a high school diploma or 12 or 13 years of schooling. Results for those with associate’s degrees are similar (not shown). Editor’s note: Read Brad Hershbein’s companion piece outlining possible causes of the earnings gap outlined here.